September 2016 was not the day we started B&R Beurs Eindhoven. 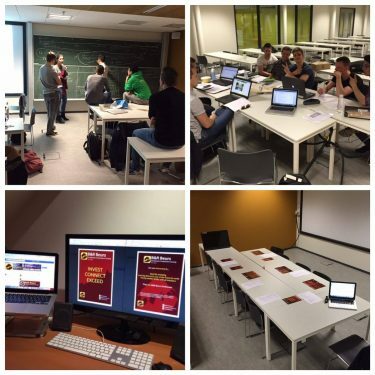 For this, we have to go one year back in time: a group of 7 students in a room in metaforum with the idea to start an investment society in Eindhoven. We had no idea how we were going to go about it or what road was ahead of us so we started with a timeline. At the end of the timeline a date: “September 2016, official start of investment society”. It was a period with many ups and downs, the only driver we had was everybody’s internal desire to start an investment society and willingness to make this work. Once September 2016 arrived we managed to get everything in place, with a little help from Rotterdam. An application form on our website, academies to teach our members about investing, a competition between the investment groups and a bar for social activities and drinks. Although most things seemed organized from the outside, we also improvised some things. The liquidity was a mess. We had no money yet, since we had trouble with our bank account. Hence, the first half year was fully paid by the board, as a loan of course. In the end, an investment none of the board members regret, seeing what the society looks like today. With an astonishing 80 members in our first year, we managed to do a lot of the things we wanted to do. However, we also saw room for improvement in almost every aspect of what we did: the competition, the academy, and perhaps most importantly: the social drinks. Having a bar on stratum proved not to be the best location, which is why the Hubble bar was contacted (at that time not yet in place). This plan was carried over to the second board of B&R Beurs Eindhoven who did a great job at moving the social drink to the TU/e campus. This is what most big arrangements and plans look like during a board year and especially in our board year since nothing was yet in place. We had the idea and put everything in place to make it a great society. We laid a foundation for many great years to come, but also room for improvement. This is every year the case, where a new board has to take over and make our society better, year by year, board by board. Until now, we managed to do so, also with a big thanks to our members, without whom there would be no society. We hope to see this bullish trend continue throughout the years and continue being a place where students can learn, have fun and make new friends, in combination with making some good profits.